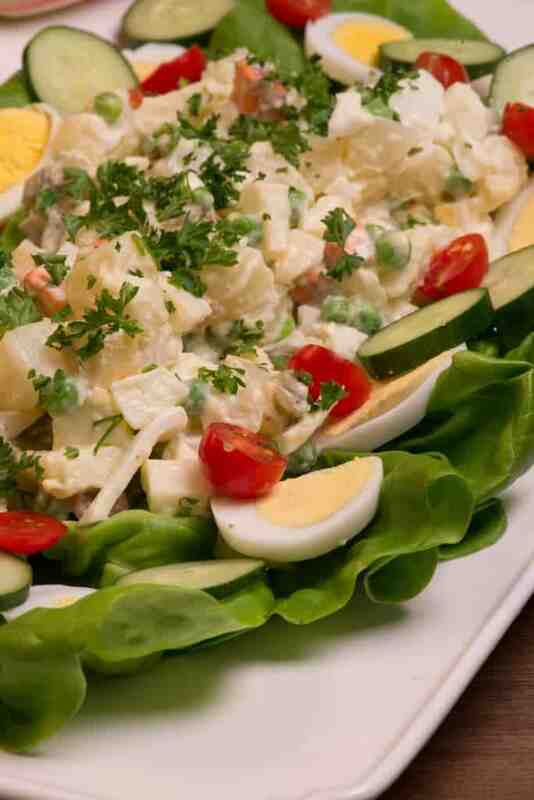 This Dutch Hussars salad called Hauzarensalade is sort of a potato salad but so much more. The name stems from a Calvary called the Hussars who could not make a fire in fear of being detected. They would simply mix things together to make a cold salad. I love these recipes where you can add just about any leftovers to it. What I loved most about this salad were two things, the dressing was light more like a vinaigrette than an heavy mayonnaise and the bite of tart apple. This is another recipe I will add to my daily repertoire. 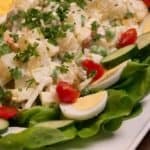 It is versatile to be a side dish or could easily make a wonderful main dish as a lunch or light summer dinner. Garnishes of preference or what you have left over in the fridge. hard boiled egg cucumbers, tomatoes etc. all served on a bed of bibb lettuce. Place in a pan, cover with water, season with some salt. Bring to the boil and cook potatoes until tender. Leave to cool to a temperature you can handle them. Meanwhile, finely dice the gherkins, shallots, carrots and cooked meat if using. Bring a pan of water to the boil, add the carrot cubes, cook for 30 seconds, then add the frozen peas and cook another 15 seconds. Drain immediately and place in a bowl. Make the dressing by combining the mayonnaise, gherkin juice.and the white wine vinegar.